Medium weight, tricot black iron-on fusible interfacing. 100% polyester, 60" x 25 yd bolt d/f. 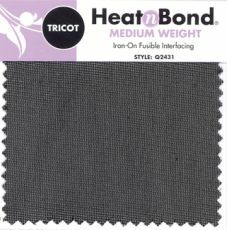 Backed by a dry adhesive film that is activated by heat, HeatnBond interfacing forms a no-sew bond three times stronger than other traditional fusible web without adding weight or stiffness. With a low temperature and short pressing time, it allows for a wider range of materials to be bonded. 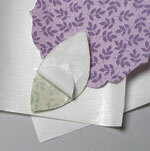 There is no seam or pressing cloth needed, and it will not lift or pucker after washing. Machine washable, dry cleanable.